Simple market share figures do not tell you that. It is a matter of context. So what did happen in 2013? Here are some headlines. You can safely predict that 2014 will be another year of “The PC is dead” “Oh no it isn’t” exchanges, providing technical commentators with an enduring topic. The PC is not dead; it runs most businesses, it is still the best tool for Office-style productivity, it is an excellent games machine, and a fine open platform for running whatever you want. Its decline is unmistakeable though; for people who can do most of what they need on a tablet, a tablet is a better choice, removing many of the hassles associated with PC ownership and offering portability that a laptop cannot match. Sales figures show that trend and 2013 will be another year of decline for PCs and laptops. Might that tablet run Windows 8? I will say some more about this in the Microsoft-specific section below; but in summary, there was not sign in 2013 of Windows encroaching in any meaningful way on the iOS/Android tablet market. The shift away from the desktop is huge for the industry. It continues a trend towards cloud and device which has been obvious for several years, but of which people are now more conscious. I dug out my BlackBerry Playbook (launched in 2011) during my Christmas clear-out. It is a nice little tablet – and the QNX embedded OS on which it is based is great – but it failed in the market for all sorts of reasons, the chief one being that it is neither iOS nor Android. 2013 was the launch year for smartphones running BlackBerry 10 (also QNX based), the Z10 and the Q10, but sales have been equally disappointing. It is a shame as the company did many things right: the operating system is good, the developer evangelism and support before the launch was strong, and the handsets in my brief looks are worthy contenders; but the barriers in front of any company trying to launch a new mobile OS have so far proved too great. Those barriers are to do with app ecosystem, the de-facto lock-in among users who have already purchased apps for their current smartphone and want to carry them over, operator support and marketing, retail support and marketing, and the difficulty of competing against Apple, Google, Nokia and Microsoft. Enterprise security was meant to be the USP for BB10 devices, but there are strong mobile device management solutions for other platforms; in fact, the current wisdom is that BES 10, the BlackBerry mobile device management software which also supports iOS and Android, may now be the future of the company. Humans are not logical creatures, which is the only way to make sense of the no-privacy story of 2013. There are two key sides to this. One is Edward Snowden’s whistleblowing over the data capture practised by his former employer the NSA (National Security Agency), which according to his reports goes beyond what the public imagines that national security agencies do and caused much consternation and indignation around the world. The other is the increasing amount of data captured for marketing purposes by Google, mobile operators, internet advertisers, retailers online and offline, and others, about which the public cares very little as far as I can tell. The question is: how much data are we willing to hand over in return for free services, and the answer seems to be, pretty much everything. One or two individuals care about this – Aral Balkan for example – but it is not an issue for most of the public. I am one who is concerned about this, because data is power, and it strikes me as dangerous to put so much power in the hands of a few large corporations, which are only lightly regulated. How much it really matters is open to debate; we are sailing into the unknown. Turning this around for a moment, for many businesses the ability to make intelligent use of what has become known as “big data” is now critical. A nod here to wearable computing, with the big story being the previews of Google Glass, embedded Android with camera, Bluetooth and Wi-Fi which is clipped to the side of your head and responds to voice control. It may or may not succeed in the market, and makes another bullet point for the Year of No Privacy, but it is a fascinating experiment with huge potential. It is not just Google Glass. Devices like fitbit and Nike+ FuelBand monitor our movements for the purpose of fitness tracking and will become commonplace – more data, more possibilities, less privacy. Privacy aside, there is no doubting the potential of such devices to improve health, not only by encouraging exercise, but moving on into things like early warning of heart problems and better data on the effectiveness of different treatments. Wearable computing is one facet of a wider field called the Internet of Things (IoT). I was fortunate to attend ThingMonk, a London event organised by analyst company RedMonk, which gave me several insights. 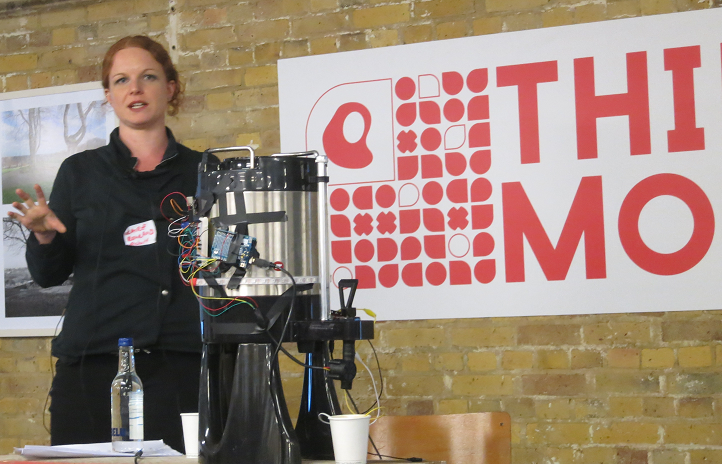 Claire Rowland at AlertMe.com talks UX for IoT at ThingMonk, next to an internet-connected coffee machine. One is that IoT will change our lives, mostly in a good way. Ubiquitous small wi-fi enabled computers will get everywhere, talk to sensors, and connect with web services to make our lives mostly better. Home appliances will report service requirements to engineers before we know, moving maps on our SmartPhone will show where our bus has got to, luggage will phone home, and so on. For businesses, IoT ability will be an important product differentiator, initially at the high end, but increasingly throughout the market in some sectors; motor vehicles is an example. 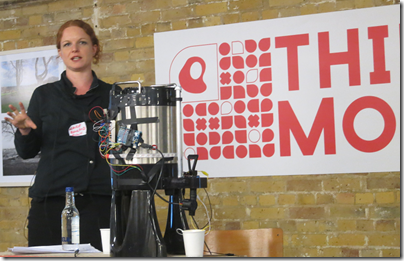 At the same time, it was evident from ThingMonk that the IoT world is full of ideas not all of which are practical and plenty of mistakes will be made. It was also evident that lack of standards will hold back the IoT. Vendors will each prefer to use unpublished APIs and proprietary protocols, to protect their business, even though open standards and published APIs would enable more innovation and be a public benefit. 2013 was the year Microsoft lost a CEO (Steve Ballmer announced his retirement) but failed to gain one (no successor has yet been announced). It is a difficult appointment: does Microsoft need an outsider with new ideas, or simply an insider with the ability to execute on the strategy that is already in place? My view is that the latter is likely to work out better. Oddly, the company announced strong financials despite the decline of the PC, which is why regard the tendency of the media to equate the decline of the Windows client with the decline of Microsoft puzzling at times. Growth areas in the last set of figures were own-brand hardware (Xbox and Surface), server and tools, and cloud services including Office 365 and Azure. It is possible that 2014 will be the year when Microsoft unveils a dreadful set of figures but I have been waiting for this a long time. Nevertheless, Microsoft’s traditional software business is under threat, not only from PC decline but also from cloud computing. Weakness in mobile might help competitors (especially Google) promote rival cloud services. Microsoft also needs to up its game in quality and performance. Bugs in SkyDrive on Windows 8.1 cost me data this year. I edited an article, saved it to SkyDrive, attached it to an email, but the recipient got an old version. It is extraordinary that Microsoft has yet to get sync right after so many years of trying. Another annoyance is the slowness of Microsoft web properties at times, including Bing. As always, this will be a fascinating company to watch in 2013. Can Microsoft continue to do whatever Nokia was doing right with Windows Phone, so that market share grows? Will the Windows 8 “Metro” platform build some real momentum as market penetration improves? What will the promised unification of phone and tablet platforms look like for developers? How will Xbox One fare against PlayStation 4, given its higher price and lesser graphics power, but greater innovation with Kinect 2 and voice control? At what point does growth in cloud computing mean that growth in on-premise server licenses will stall? Twitter got worse in 2013. More sponsored posts and the appearance of inline images on the web site mean that for me the appeal of the controlled, short-form feed which made Twitter great has been diluted. Google search got worse in 2013, with more ads and more brand-driven results, and its insistence on putting Google+ at the centre of its services became an annoyance. Facebook too is increasingly commercial. These are businesses after all. Overall though, it seemed that the web got more proprietary in 2013. During much of 2013 I edited a section on the Guardian web site focused on social media marketing. The opportunity to talk to many experts in the field has been illuminating. Social media is not a short-term fashion; rather, it has changed the way we interact with each other and made it richer and more public. It is also changing marketing, and not just marketing, but the way businesses engage with their customers and potential customers. Speaking for myself, user reviews on the likes of TripAdvisor and Amazon are now a significant influence on my purchasing decisions. Despite the fact that such platforms are gamed by vendors, overall I believe I am making better decisions as a result. Whether or not I am right about that, the influence is real. The positive aspect of social media is the opportunity it presents for businesses to be better informed and more responsive to customer needs, and the increasing power of customer opinion to influence others, resulting in better products and more responsible behaviour. Negatively though, social media marketing means that our public interactions with friends are now invaded by brands looking for a marketing opportunity, enabled by social media platforms which are monetized by selling our personal data (though hopefully anonymized) and access to our social media feeds. When that vendor interaction is shallow and one-sided, it leaves a sour taste. The good outweighs the bad in my opinion, though see again the note above on the Year of No Privacy. Complete my Windows 8 game; I am working on it and will write up the experience in due course!